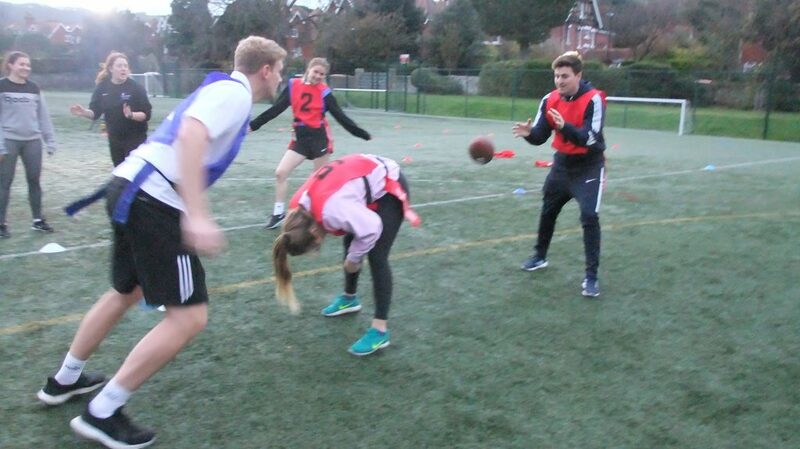 Trainee PE teachers were introduced to a different version of football – American Flag Football. Football is played in many forms around the world. In Ireland pupils are taught Gaelic Football, in Australia it is Aussie Rules Football and in the UK it is Association Football and Rugby Football. A game played widely in schools in the USA is a non-contact version of American Football called Flag football. Players wear belts with two flags attached by Velcro. Opponents have to attempt to remove the flag which indicates a tackle has taken place. Just as in American football teams have four attempts to advance with the ball ten metres. The principals of flag football are essentially the same as other versions whereby the object of the game is to manoevre an object (spherical or oval) through a defended territory to an agreed target over a prescribed period of time within set parameters.